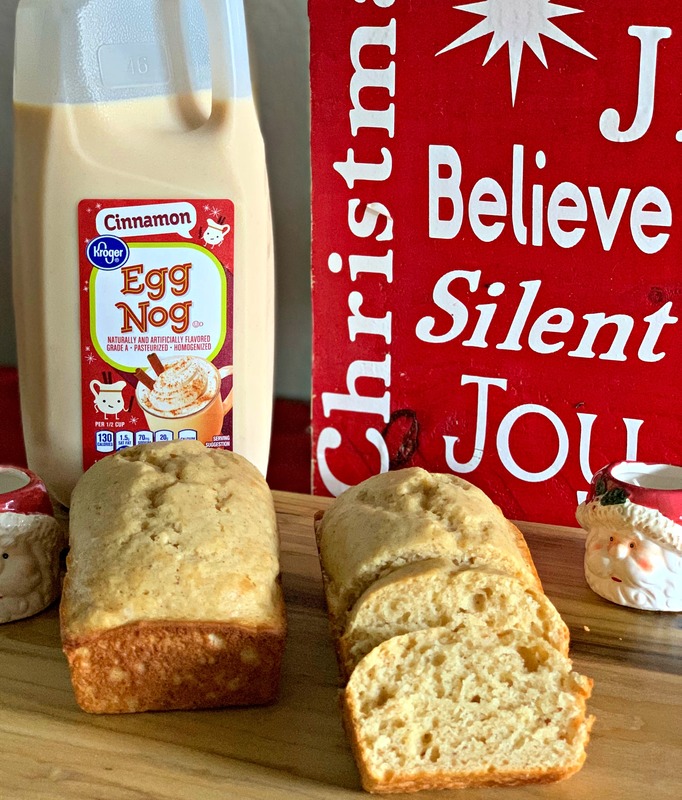 The seasonal flavors of eggnog, rum extract, and spices shine through in these moist, mini loaves! Pairs perfectly with a cup of coffee! As we head into the Holiday season, Christmas baking begins! This definitely goes down as my most favorite time of year! There is nothing better than Christmas music playing, a fire going (even though I live in Houston and have to pretend its cold), and baking goodies in the kitchen! A yearly tradition I have is to make mini loaves of bread for my kids’ teachers! Usually I make banana bread, but this year, I wanted to try something new. 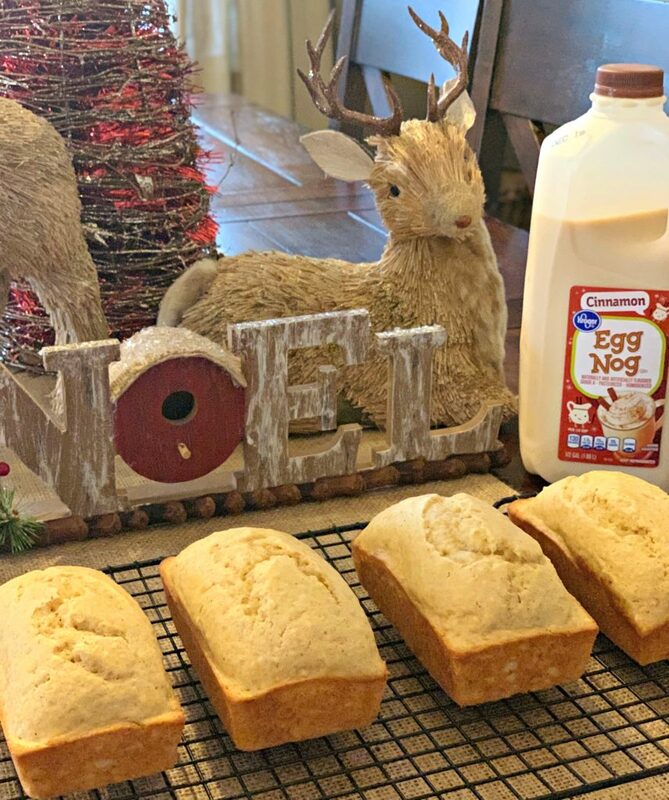 Yes, I am still a few weeks early, so I will have to make a second batch, but this eggnog bread might just be my new favorite treat! The combination of eggnog, rum extract, and spices really go perfectly together! 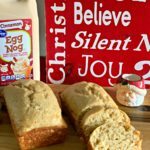 Whether paired with a cup of coffee, enjoyed warm with some butter, or as a sweet treat….this is a great seasonal bread! As I mentioned above, I plan to make a second batch and bake them in ceramic mini loaves as part of a teachers gift, but these would be great gifts for coworkers, friends, family, served at a gathering, or even frozen for a later date! 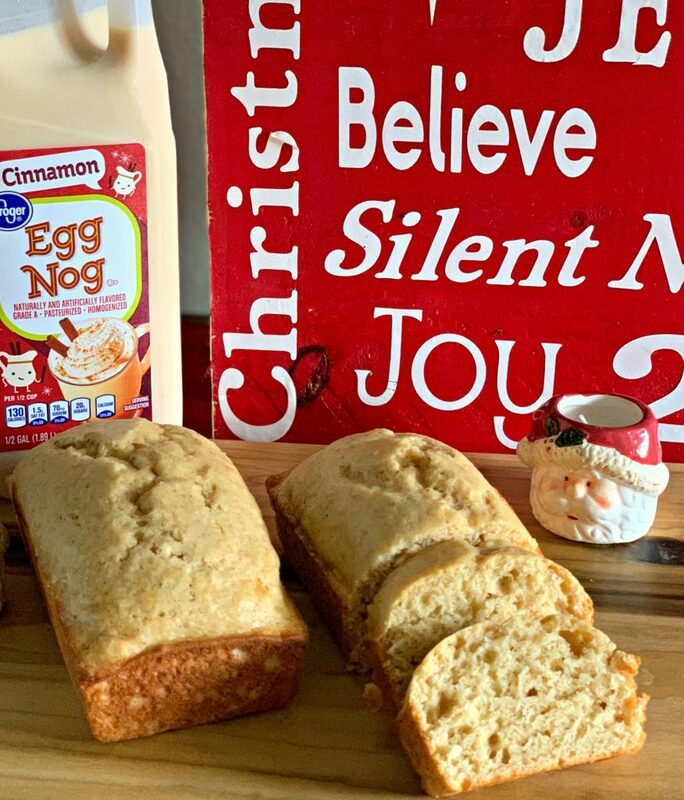 If you aren’t a huge fan of eggnog, I still recommend trying this because honestly, I only enjoy about one sip of eggnog each year (not my fav), but this bread is quite moist, flavorful, and my new Holiday favorite! This bread isn’t dense at all, has a cinnamon/vanilla type flavoring, and is very similar to my Snickerdoodle Bread! 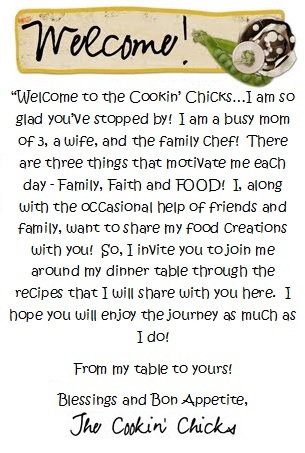 I hope you have a wonderful, Blessed, Holiday season ahead and enjoy this! 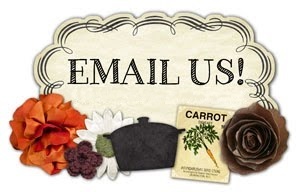 Be sure to let me know what you think!! Here are the mini loaf pans I use, https://amzn.to/2E3HHql, this recipe makes about 4 mini loaves! In a large bowl, combine the flour, baking powder, salt, cinnamon, nutmeg, and allspice. In a medium bowl, combine the eggs, eggnog, sugar, melted butter, vanilla extract, and rum extract. Combine the wet mixture to the dry mixture and stir until just combined. Pour batter into a greased loaf pan or 4 greased mini loaf pans. Bake in a preheated oven, 350 degrees, for about 30 minutes if mini loaves or 50 minutes if large loaf. *All ovens cook differently so be sure to keep an eye on the bread a few minutes before suggested. Remove from oven and allow to cool for 2-3 minutes before removing from pans and serving! In lieu of rum extract, you can also use rum, whiskey, or brandy (alcohol)! 2 tsp as you would simply use it in place of the extract, however, you could choose to omit the vanilla as well and increase to 4 tsp. Hope that helps! Enjoy! Can you make just one regular loaf? Absolutely! Just increase the baking time by at least 15 minutes, probably about 60 minute cook time though!